Seaside by October Afternoon for Riley Blake came out a few months ago and I really loved the soft look and vintage feel of this line. But I didn't buy because I have still similar shades in my stash. But time and time again I came back to it and always thought "tis really lovely". So in the end I caved but went the sensible route and bought a layer cake that I sneaked into an order I was doing at fatquatershop anyway (well that was my excuse). And I am so glad I did cave. When it arrived I got so overexcited that I didn't even took the time to take a photo for a stash note but instead cut the layer cake up quickly in 96 five inch squares. 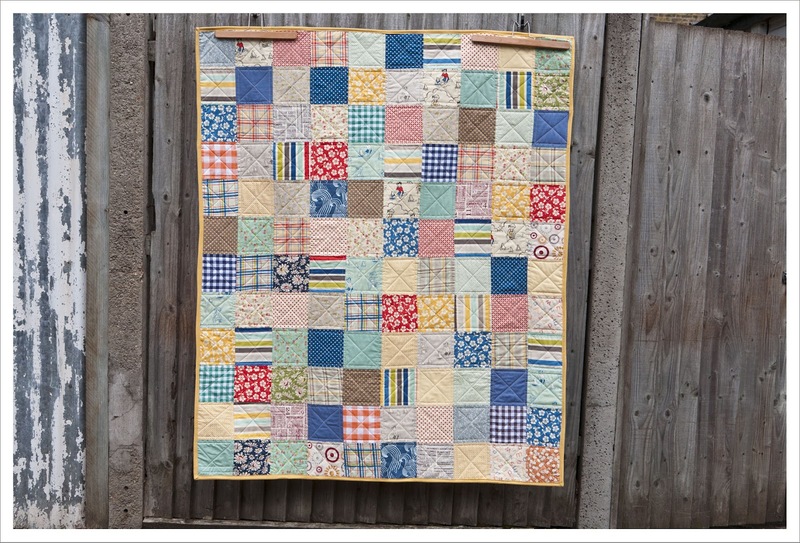 Then I added 24 squares from stash; some American Jane, some Japanese fabric, some Hometown and Pure from Sweetwater and some gingham and a new quilt top was done. Easy peasy ! 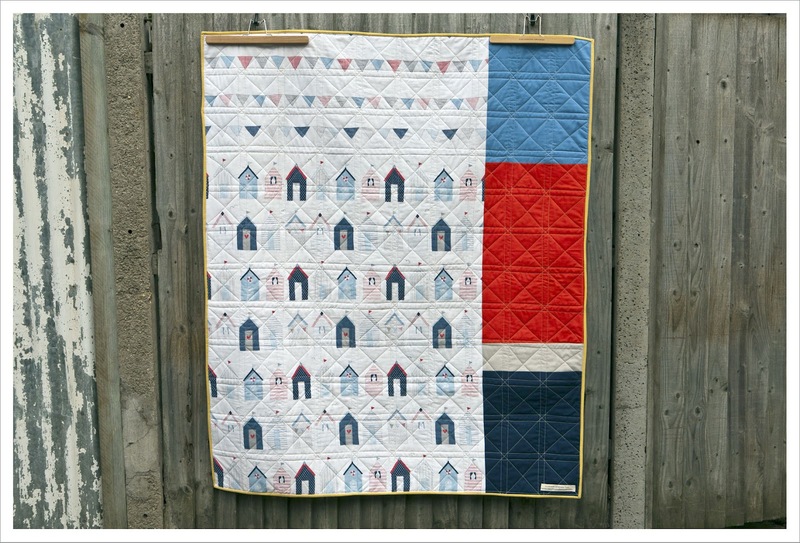 For the quilt back I had the perfect seaside fabric in my stash that I bought a few months ago; 'the brits are coming', beach huts and bunting! I added some Kona in complimentary colours and started with what is now my favorite part of making a quilt, the quilting itself! 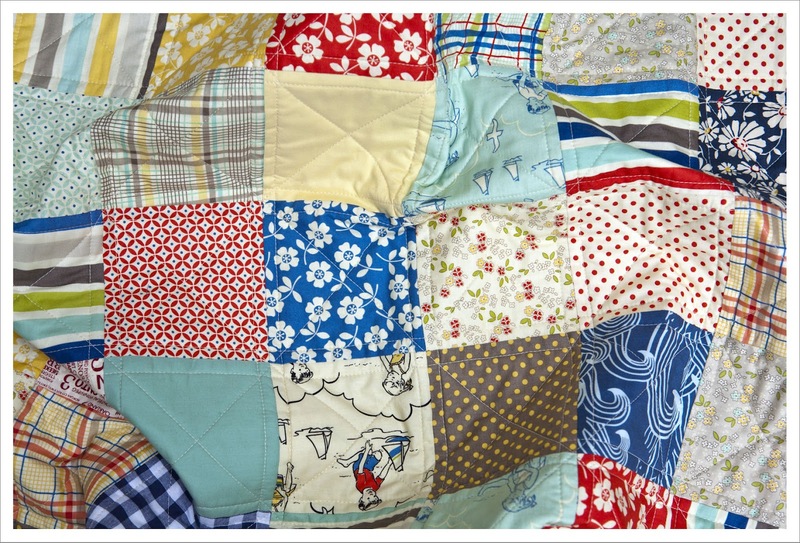 My favorite part used to be to chose and attach the binding because it gives a quilt the right frame. Funny how these things change over time. Has your favorite part in the quilting process changed over time ? I quilted in straight lines as per usual along the seam lines of the squares but decided when I was finished that more was required so I added diagonal lines until I was happy with the result. The binding is a stripy number in a sandy/beige colour that compliments the front and contrasts the back thereby adding the all important frame to the quilt. I really love this quilt and the soft colours, there is something about this fabric collection which is precisely why it came back to me all the time like a boomerang. 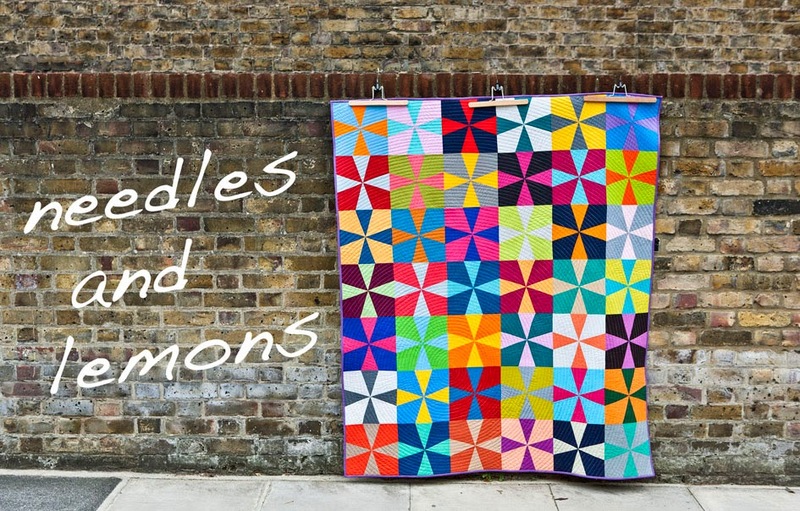 The quilt is about 45" x 54" (1.10m x 1.35m) and can be found in my Etsy shop here. Isn't it funny how sometimes we just can't get a collection out of our head, and it isn't just those 'hero' collections like Flea Market Fancy? I love California Girl. I've been ignoring the urge for so long...but I think I might have to have some soon! I caved and bought the FQ bundle. I can't wait to sew with it. It really is so pretty and fun and fresh. Your quilt is perfect. I love what you did for the back too! This is,such a busy quilt Judith, and I just love the back! 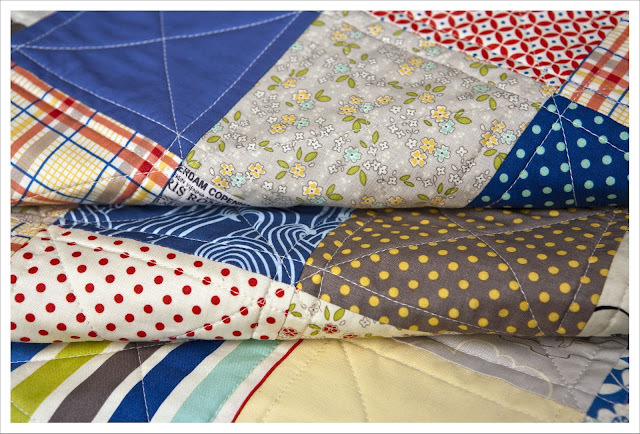 I can see why you love this quilt, it's so pretty! I LOVE this Judith! 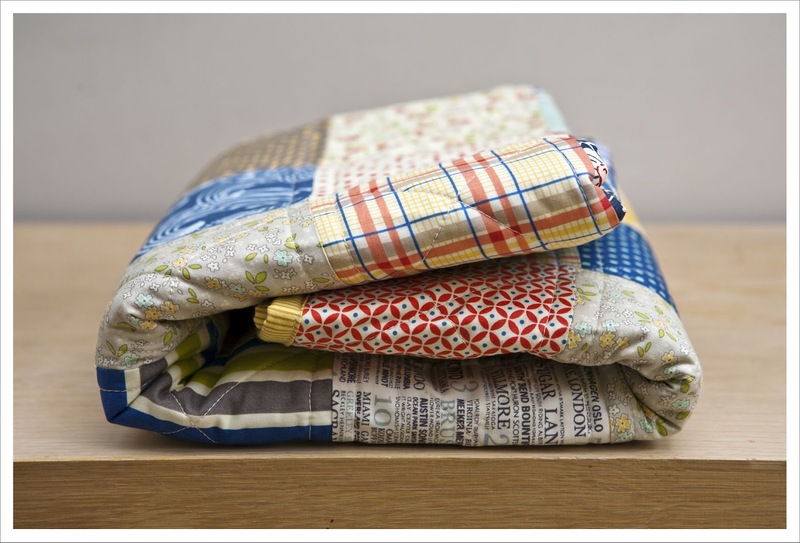 I have been eyeing the plaid and spot prints from this collection too to make a quilt for my little boy. I never thought of buying the layer cake. I love how simple this is and the back is great too and that solid blue is gorgeous! My favourite part is always piecing together the top, and then hand sewing the binding. 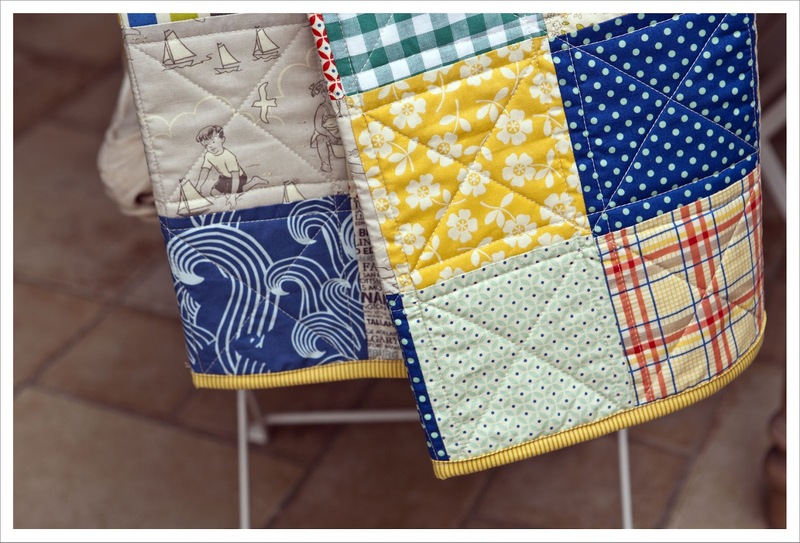 I am not a fan of the quilting! No change yet!